They were just four and a half minutes, but they were fruitful. 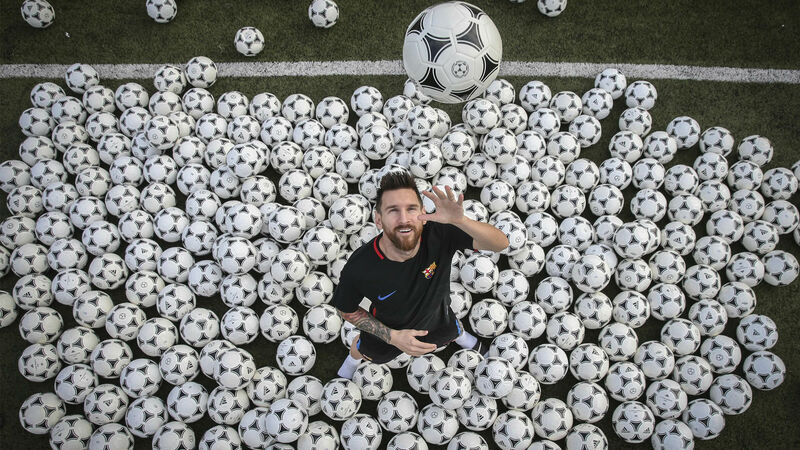 Lionel Messi was due to start training at 11am but turned up at 10.08, relaxed and smiling, at pitch nine of the Barcelona training complex, with Sergi Nogueras from the club's media team, to pose for a photograph for SPORT. A photo of him in a goal, acompanied by 300 balls, that number to mark the number he has netted at Camp Nou since his debut. The Argentine knew SPORT's plans but was still surprised to see them all on the pitch. Valenti Enrich, one of SPORT's photographers, explained to him how he had to pose and Leo accepted happily, ready to do everything the photographers wanted. The Argentine submerged himself in the cloud of balls while smiling, with SPORT snappers Joan Monfort and Marc Casanovas working to take photos and on flash duty. "Now look horizontally, towards that Barcelona badge," asked the photographers. Enrich climbed a four-metre ladder to take pictures from a different vantage point. Between photo after photo, Messi looked at his surroundings, surprised. "Where did they get all this?" he asked, referring to the balls. Messi did what he was asked to without any complaints or problems. He was comfortable among the balls, playing and throwing one from one hand to the other. He was in his natural habitat. When the photo session was over he struck a ball with his left foot, despite wearing flip-flops. Before returning to the dressing room to get ready for training, he signed a couple of autographs and took a photo with Edu Melchor and Adria Rius, who were essential in the pumping up and the transporting of the 300 balls.